Annaelle, Anthony, Clara, Julien, Mathieu, and Océane were visiting the ITER site for the first time. Equipped with site gear, and pen and paper in hand, they had two short days to discover the ITER Project, visit the ongoing works, interview a few of the ITER "actors," and write and realize a two-page newsletter, the ITERview. Chosen from among the junior high schools of the region, these five young people were participating in the 16th edition of the Rencontres Cadarache-Jeunes, an annual event that gathers nearly 200 ninth-grade students to the CEA site to participate in workshops intended to "offer a direct approach to the various scientific disciplines represented at the CEA, introduce them to a scientific and technological research centre, and put them in contact with the men and women who have made science their profession." For the five students who were assigned to the ITER workshop, the goal was to learn the basics of scientific communication—research, writing, interviewing and computer layout. To all appearances, they had fun doing it. The result of their work is colourful, playful and informative. In addition to informational articles about fusion, the ITER machine and the construction project, they enjoyed asking fellow classmates "What do you know about ITER?" Answers ranged from "It's a thing that spins," to "Why, it's the future of energy!" 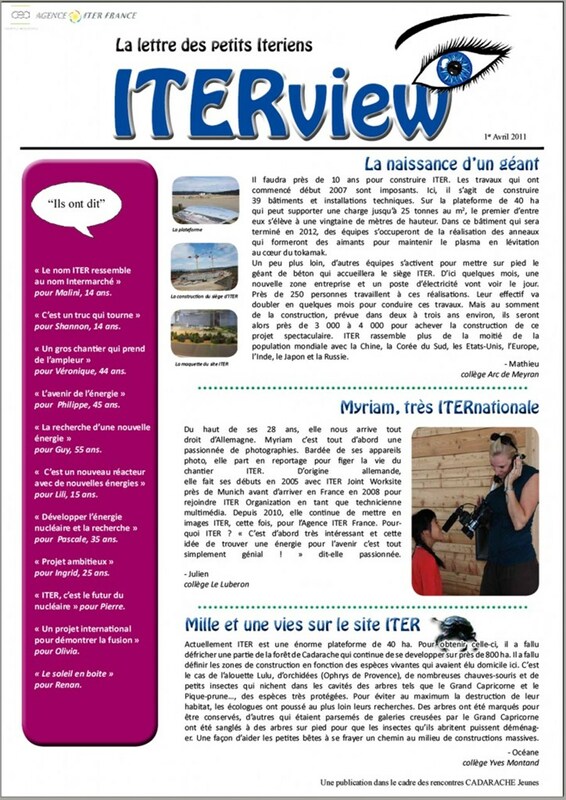 The production of the ITERview was overseen by Sylvie André from Agence Iter France, with layout support from Myriam Jacobs. Read the ITERview (in French) here.